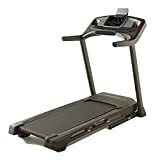 Walk, run or sprint to improve form and cardiovascular fitness using the Proform Performance 410i treadmill with a 2.5 CHP Mach Z- motor that speeds the belt to a maximum speed of 18kph (11.2mph). For safe and enjoyable training sessions, it has a good-sized running area (51cm x 140cm) and the 1.9″ precision machined and balanced non-flex rear rollers reduce heat and wear and tear on the tread belt. Customize your workout with a touch of a button thanks to Quick Speed- and Quick Incline- controls and target different muscle groups adjusting the incline from 0-10%. Check your progress on a user-friendly round Watts LED display with Endurance, Tempo and Peak zones or review workouts via Custom Performance Center for more detailed information. The machine lets you stay challenged offering 19 motivating programmes and to maximize workout experience, it is compatible with iFit® technology. It boasts ProShox- cushioning system to reduce impact on the joints and for quick and easy storage, there is Space Saver folding design with Easy Lift Assist. Plus, to measure heart rate, you can use hand pulse sensors or Bluetooth® Smart wireless receiver with an optional chest strap for a more accurate reading. An integrated, ergonomically positioned tablet holder allows for multi-tasking.